At Holton Community Hospital in rural Holton, Kan., two cast-iron atmospheric boilers and three gas-fired water heaters that had been in place for nearly 20 years were operating inefficiently. On one of the Knight XL heating boilers, a Grundfos MAGNA3 variable-speed circulator pump was installed. The boiler controls the speed of the pump using the built-in Smart System. When the boiler modulates down, the pump slows to maintain a constant temperature rise across the heat exchanger at all times. Reducing pump revolutions reduces power consumption tremendously. Monitoring equipment was placed on both the lead boiler and the member boiler not dedicated to domestic water. The lead boiler had the MAGNA3 40-80 F variable-speed circulator pump, while the member boiler used the UPS 43-100 F constant-speed circulator pump. For analysis, the team compared two similar days, March 20 and 21, at a time when only the two monitored boilers would be running. At that time, domestic water use would be unlikely, reducing the chance the third boiler would fire and affect the measured values.Figure 1 shows the power consumed by the constant-speed circulator and the variable-speed circulator when each was the lead. FIGURE 1. Pump power consumption. Pump-speed modulation resulted in significant energy savings. 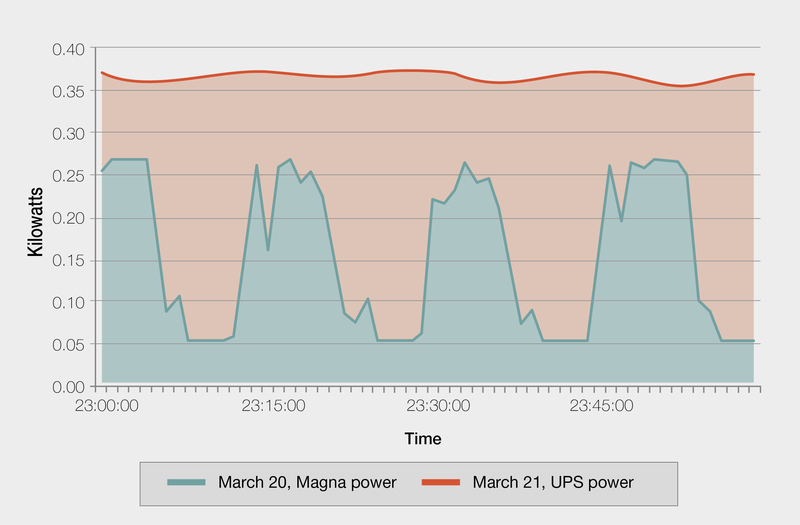 The MAGNA3 reached a maximum power usage of 270 W, but slowed to a minimum of just over 50 W, while the UPS ran at a continuous 365 W. Over the course of the hour, the MAGNA3 averaged 156 W.
With Smart System, the boiler adjusts the flow through its heat exchanger to control delta-T as well as system median temperature. Delta-T across the boiler is constant, resulting in enhanced building comfort, increased heat transfer, and electricity savings. This entry was posted in Energy Efficiency, Green Building & Architecture, HVAC Equipment, Renovations and Retrofits and tagged Energy Efficiency, Energy Management, Engineering, Green Building by duanetilden. Bookmark the permalink.